In September, the Abbot was invited by the Institute for Spirituality and Health at the University of Texas Health Science Center to participate in a series of presentations for health care professionals and others on religious perspectives on caring for people at the end of life. This process aids in the expansion of health care perspectives beyond a strictly Christian understanding of approaching illness and death. She and Alejandro Chaoul presented the Buddhist perspective. In October, she attended the Fifth Ward Enrichment Program (FWEP) luncheon with HZC Board member, Troy Porter. Troy is the President the Board of FWEP. Both Troy and Houston Mayor Sylvester Turner gave inspiring talks at the luncheon and raised funds for the Fifth Ward-based program "Our Boys Matter." In late October, she attended the four-day Soto Zen Buddhist Association (SZBA) meeting in Minnesota. This is a valuable organization (she is a former President of the SZBA). Among other connections, she met Thomas Bruner, a member of Dharma Rain Zen Center (DRZC) in Portland, Oregon. Thomas led the large capital campaign to rebuild DRZC's campus and he agreed to visit HZC to work with our Planning Committee on Saturday, November 5. The meeting with the Planning Committee was excellent and Thomas would love to return to continue to help us. At the SZBA gathering, she also met David Loy, a Zen practitioner and writer who wrote The Great Awakening: A Buddhist Social Theory. He is building a center in Colorado that will focus on climate issues. The Abbot invited him to lead a one-day workshop at HZC on April 22 for Earth Day. 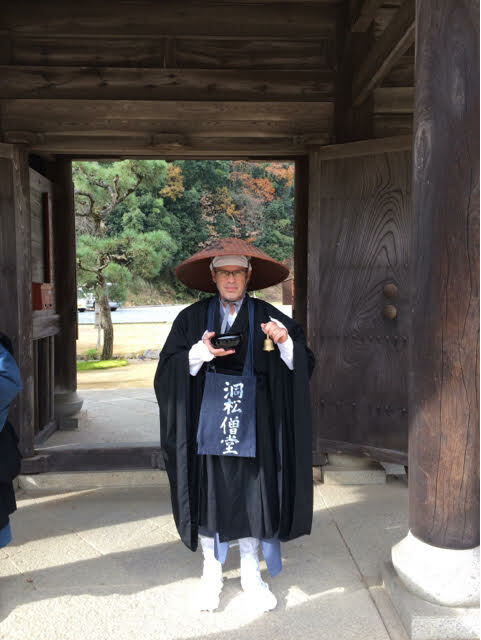 She continues to serve on the committee of the Association of Soto Zen Buddhists (ASZB), working out a roadmap to negotiate the relationship between American Soto Zen Buddhist teachers and Japanese Soto Zen authentication procedures. She continues to support the Dallas Meditation Center, whose late teacher Brother ChiSing passed away last year. The group has not yet found a new teacher. She continues to support Austin Zen Center as its Board searches for a new teacher upon Kosho McCall’s departure. She contracted and oversaw several lighting improvements in the 1605 building along with pre-wiring for the sound system that is in the works for the newly-opened side zendo. 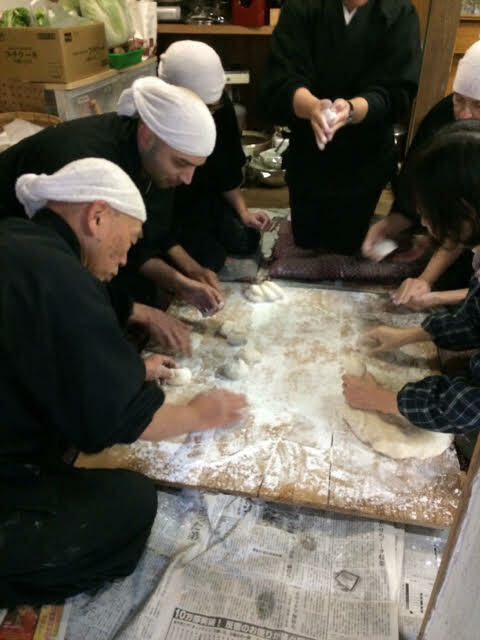 She continues to work on the Tenzo (cook) procedure for retreats, preparing food and menus for Rohatsu. She was invited to contribute to a recent BuddhaDharma magazine column on responding to difficult situations. The article appeared in the Fall issue. And last, but not least, she continues to meet with her prison group north of Huntsville almost every Monday, often accompanied by Dan Le or Tim Schorre. The prison sangha now comprises more than 20 men. On one recent day, the group discussed the topic of anger. One of the members said, “If I knew then what I know now, I wouldn’t be here today.” The group meets for two hours, with meditation, a brief service, sutra study and conversation. 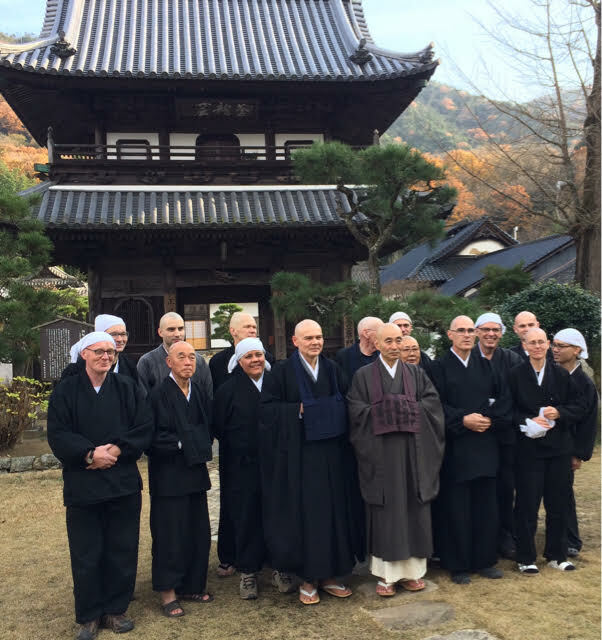 The annual Tenshin Reb Anderson Roshi retreat will be on the “Pivotal Activity of All Buddhas.” Tenshin Roshi served as abbot of San Francisco Zen Center's three training centers (City Center, Green Gulch Farm and Tassajara Zen Mountain Center) from 1986 to 1995. 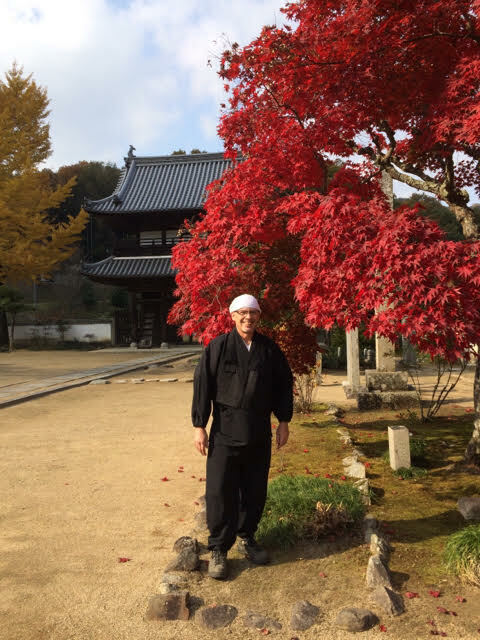 Tenshin Roshi continues to teach at Zen Center, living with his friends and family at Green Gulch Farm. He is author of Warm Smiles from Cold Mountains: Dharma Talks on Zen Meditation, Being Upright: Zen Meditation and the Bodhisattva Precepts and The Third Turning of the Wheel: Wisdom of the Samdhinirmocana Sutra. We will hold the retreat at our Zen Center from February 14, Tuesday evening at 7, to February 19, Sunday afternoon. We are hoping to fill the temple. Please, sign up for the whole retreat or part of it. It is an invaluable opportunity to deepen your practice, connect with the sangha, and connect with this venerable teacher. Every year, we have two membership meetings, one in October for nominating at-large Board members and one in December for reviewing the next year’s budget. At this year’s December meeting, we announced the new at-large board members Audrey Charlton and Laura Hopps. Laura was voted in as a new Board member and two already-serving at-large members were confirmed by the vote—Carter White, who also serves on the Finance Committee, and Forbes Alcott, who has taken on the task of the Maintenance and Grounds Report for our monthly Board meetings. Audrey was selected by the Board to fulfill the remainder term of Dan Le. The members of the Board send a warm thank you to Tom Biddle and Dan Le, who have served faithfully as at-large members. Their service has been invaluable for bringing a wholesome balance of stability and innovation to our Center. The main purpose of this December meeting was the Board’s presentation of the 2017 to the membership. Our Board treasurer, Gary Grubitz, presented the 2017 budget and answered questions from the community. Thank you to Gary for his clarity and thank you to Parmita, our bookkeeper for her illuminating graphs. During the December membership meeting, the key questions were how much we had raised and how donors should communicate their donations to this capital campaign. The structure of our pay-off agreement with the lender requires us to run a separate capital campaign to pay-off the mortgage—not to treat it as part of operating expenses. It is common practice in bookkeeping to have separate funds for the daily operating expenses and other campaigns like the Retire the Mortgage campaign. (See chart below). The mortgage on 1605 Heights Blvd. What do we get for it? A very generous friend lent us the funds to purchase the 1605 Heights property in 2007 when we had outgrown our temple at 1244 Heights. The loan was for $1,000,000. We have successfully reduced the principle to $400,000 by applying the proceeds of the sale of the 1244 Heights property along with donations from a generous friend. Now it is time to pay the remaining $400,000 plus interest. We have a note to repay the remainder over five years. We made the first $84,000 payment in May 2016. If we make the next three payments on schedule, the donor will forgive the last payment. HZC has an operating budget of about $190,000. A little over half of the revenues come from membership dues. The rest comes from programs like sittings, retreats, classes, and rent of the carriage house and the condominium. When you communicate the purpose of your donation for the mortgage retirement, our bookkeeper, Parmita Derden, posts that money to that particular fund. The Treasurer has assured us that we have done a great job of maintaining the stability of our operating expenses through our regular monthly, quarterly, or yearly membership donations. The capital campaign to retire the mortgage has also been successful so far—and we need to keep our focus on it so we can meet our obligations. We want to stress the importance of every gift. We have been thrilled at gifts of $5, at gifts of $500, and at gifts of $10,000. Each gift tells us of our supporters’ commitment to the dharma work of our temple. Please, communicate your intentions for the succeeding years of this campaign with a note to the Treasurer. You can add to your monthly dues, designating the portion that should go to the capital campaign, or pay a lump sum with that designation. Several donors have pledged to pay a set amount each year until the mortgage is paid in three years. On December 11, we had a Seijiki Ceremony to honor the spirits of departed ones. For this ceremony, we set up a special altar, offering sweet water and incense, and we read the names of those who have died in our sangha’s circle of friends and family. Before we read the names, we use noise-makers of all different sorts from simple bells to kazoos to a trumpet played by our Ino, Vicki Glenn. We do so to call all the hungry ghosts to gather. After we read the names, we each had the opportunity to offer incense, setting our intention or honor the memory of loved ones. This commemoration of those who have passed reminds us of the preciousness of our time together and gives us heart in our efforts to hear the cries of the suffering in the world around us. Kosho McCall will be retiring from his abbotship at Austin Zen Center, ordaining in the Tibetan tradition, and taking up monastic practice. He has been a deep friend of our temple for many years, connected with our abbot from their time practicing in San Francisco at City Center and at Tassajara. He has supported our temple in many ways, always a favorite when he comes to give dharma talks. We are honored to have him stay with us through the month of January. We wish him well in his dharma journey and hope he will come and visit us. Isshin was our Ino (literal translation "bringer of joy to the assembly"), the supervisor of the meditation hall, for several years before moving to Japan for work. He has been living in Japan now for several years, working at Meiji university as a geological research scientist. In mid-October, he entered the monastery for a three-month practice period and has been happily training ever since. He has been able to communicate with short messages. Here are some of the highlights. Of the tradition of begging alms, Takuhatsu, Glen says, “it was so much fun! We went down the street with thirty priests from the local Buddhist association. Each tradition has a different way. I was with a priest and we chanted the last lines of Hannya shin gyo really loudly. And if someone gave us Dana, we chanted Enmei Jukko Kannon Gyo. It was noisy and fun. In two hours, we collected $1200 for temples damaged in the earthquake. About fifteen of our members participate in a correspondence with people living in prison all over Texas. People send letters to us at the Zen Center with humble requests—to learn about the dharma, to connect with someone who is on the Path, to know that someone cares for them. We don’t have a formal curriculum to offer. Instead, each pen pal shares the practice of our day-to-day lives—how we deal with impatience, how we live Right Speech, what we do with feelings that seem like they’ll overwhelm us, how to work out the mechanics of sitting meditation. In the process, we learn a little about the lives of our brothers and sisters who live in prison. Our generous sangha has donated books and magazines to be sent to our prison correspondents. With our letters, we often send a book or a magazine. One correspondent writes of these donations: “I really appreciate the books you send me. I read them and learn from them, then I pass them along to people that are curious or interested in that sort of knowledge.” Another correspondent describes his joy at getting the books as similar to a child getting a birthday gift. If you would like to clear out your bookshelf or donate your dharma books and magazines, please, think of the prison correspondence program. We have a box in the closet of the upstairs Clay Room, the small room just off the big classroom. Please, drop off your donations and know that they will be well used. The group chose this film as a timely reminder in the month of December shopping of the alternative to consumer excess in minimalism. The film explored the many ways people live minimalism, striving to live a meaningful life with less. The dates of the next movie nights will be announced in the coming weeks. We’ll have two linking movie nights on gender stereotypes, the first of which is titled Miss Representation. Watch for the dates! Movie nights are a great time to invite people interested in the Zen Center who want an informal introduction to the community. Gaelyn Godwin Roshi focused on the Ocean Samadhi Mudra Sutra for Rohatsu sesshin this year, offering Dogen’s teaching that concentrates the Avatamsaka Sutra into a few pages of reflections. Assisting Gaelyn Roshi in this teaching were Tanto Kogen Glen Duval and Rev. Dave Rutschman. About twenty people participated in this sesshin. Literally "touching the heart-mind," sesshin is a period of intensive meditation (zazen). Rohatsu is a special sesshin, literally meaning the eighth day of the twelfth month. It’s the day on which we celebrate the Buddha’s enlightenment, also called Bodhi Day. For our celebration, we circumambulated the temple building, chanting the Heart of Perfect Wisdom sutra to the heart-vibrating sounds of the drum, scattering rose petals as we went. Dan Le will join the Compassionate Service Society, a non-profit organization based in southern California, founded by Master Ce Hang Truong in 2002. Though founded on Buddhist principles, CSS takes an ecumenical and all-inclusive approach, integrating the teachings of Buddhism with the best of twenty-first century practices to bring unity and healing to the body, mind and spirit. Its goal is to facilitate the practice of Bodhisattva ideals (altruism) and to promote holistic living. CSS offers Tai Chi, Meditation and Relaxation classes plus vegetarian cooking classes. CSS headquarters offers weekly radio and TV programs in Vietnamese, meditation retreats, the annual World Peace Gathering and special trainings for its working members. After this year with the Compassionate Service Society, Dan plans to spend a year in monastic training at Tassajara Zen Mountain Center. We wish Dan a wonderful dharma journey! We will miss you, Dan, and we’re proud of you for your courage in taking this bodhisattva step. Watch for the date to be announced of Dan’s going away party! The Abbot, the Tanto, Glen Duval, and the Ino, Vicki Glenn, have been working hard to build a course calendar that will serve the varied needs of our membership. The full year hasn’t yet been booked, but see below the upcoming class offerings. Please, check the website to find out whether you need to purchase a book for the class. If you have questions, send them to houstonzen.org and they will be forwarded to the teacher, who will contact you. Yoga and Meditation, a course offered by Brian Burrell, a yoga instructor and Zen meditator, for six Mondays, starting January 2. Not Always So, a course on Shunryo Suzuki Roshi’s book of that title, offered by Tricia McFarlin for six Tuesdays, starting January 3. Introduction to Zen Meditation, taught by Abbot Gaelyn Godwin Roshi and Gyoshin Dan Le, for five Thursdays, starting January 5. Contemplative Photography, taught by Christian Bumpous, for six Saturdays, starting January 7. Tai Chi Qigong, taught by Henderson Smith, for six Wednesdays, starting January 11. Dogen, taught by Tom Biddle, for six Mondays, starting February 13. The Path to Enlightenment, Part 2 of The Four Noble Truths, taught by Kogen Glen Duval and Tim Schorre, for six Tuesdays, starting February 21. You do not need to have attended the first part to participate in this part. Every year, we come together as a sangha to send out the old year and bring in the new. It’s one of the key times in the year when new people come to the temple to seek the refuge of its peaceful atmosphere. We begin the evening with sitting and walking meditation. We take a convivial break to chat over warm drinks and then we return to the temple for the beautiful ceremony of bowing in full prostration 108 times, each to the resonant sound of the large temple bell. Surprisingly, this process only takes about fifteen minutes. Some people participate in all 108 bows, some stay for some of the bows at the beginning and end. We assure people that they are welcome to participate fully in whatever way is best for their own body and mind. Once we complete the bows at the stroke of twelve o’clock, we give one another warm embraces and then proceed out to the small bonfire. In the weeks leading up to the celebration, we’ve been collecting small pieces of paper on which we have written down the hindrances we wish to leave behind with the old year. Now, over the bonfire built by Rev. Dave Johnson each year, we ceremonially burn these hindrances. We also follow the tradition of burning all the old scraps of paper we have used for ceremonies and all the stubs of incense sticks that we have burned all year at the temple. When the last scrap is sent to the flames, we stare into the flames, pondering the reality of impermanence, embrace again, and make our way home.